You know I went to a bead show a few weeks ago and bought a bunch of beads. I got home and started to put them away and realized my pegboard was full of beads. I was running out of room! So I put up a wood shelf that was a board and a couple of brackets I bought at the hardware store. After I got it up I realized I could indeed get more beads on it. I bought some cup hooks and started screwing them into the bottom of the shelf. I can now hang beads underneath too. I will eventually add more rows of cup hooks but one is enough for now to hold my beads. Just thought I would share my idea with you. 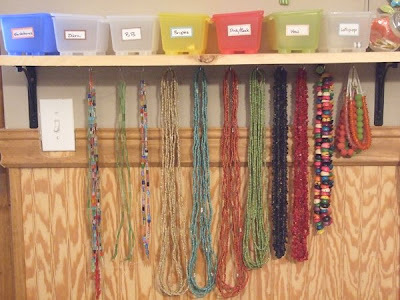 I did a post previously about the rest of my bead storage, you can see it here. Oh and by the way...New things on Etsy today.